Strong work ethic and drive to perform work with integrity. A quality approach to work with the ability to recognize potential issues and proactively manage for quick resolution. Positive mindset and results driven. Clean DMV record (ability to be insured). 2 years of plumbing experience preferred but will train right individual. It is hard to find someone who has lived in the Sacramento area and is not familiar with the red and white Bonney vans or the catchy 444-0551 jingle of Bonney Plumbing, Heating & Air. Back in 1970 when Mark Bonney got his first taste of plumbing at the age of 15 while helping a friend install PVC piping in a mobile home park, he had no idea of the future success this experience would bring. During his junior year at Anderson High School, Mark pursued his desire to be a plumber. He got a job with a plumbing company in Redding through a Work Experience class at his school. He started out as an assistant – washing vans, delivering parts and cleaning the shop, but by the age of 16 he was ready to be put in a company van as a plumber. He had phenomenal success as a service and repair plumber. Mark joined the plumbers union in 1976 and learned the new construction trade for residential and commercial plumbing. In 1978, he became a licensed contractor and began his own business R.M. 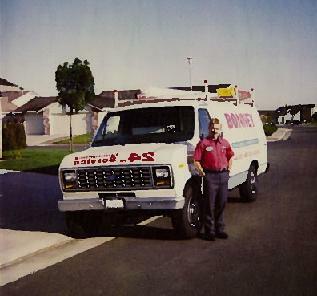 Bonney Plumbing; and in 1990, the first Bonney service van was put into operation (we now have over 100). The company grew with an emphasis on service and repair plumbing and continued to offer new construction services as well. Bonney has always been active in the community and through its Bonney Cares program which gives back to many local charities. The next logical step for Bonney was to align with the Sacramento Republic FC in 2014 to help bring a USL Pro team to the thriving community. This partnership included the naming rights of the new soccer facility at Cal Expo; now dubbed Bonney Field. This partnership made sense because of the strong connection that Bonney already held with the community. The company has always been dedicated to creating a positive, family-like atmosphere for employees and customers alike. The aligning of Sacramento Republic FC and Bonney continued to strengthen that bond. Along with the sponsorship of the Sacramento Republic FC, Bonney has continued to expand its service areas to include the East and North Bay regions. O’Connell Plumbing, Heating, Air & Rooter Service in San Rafael and Cal Coast Plumbing in Pleasanton joined the Bonney team in 2013 and 2014, respectively. This presented a fantastic opportunity for Bonney to provide its unmatched quality and service to customers in the Bay area regions. Bonney has come a long way from the first service van in 1990. Although Mark has retired from the day to day activities at Bonney, Candace continues to be involved; she works closely with President, Allen Crick and the rest of the staff at Bonney. While Bonney continues to grow and expand its service areas, it still maintains the founding ideas from Mark and Candace Bonney; providing excellent customer service, unparalleled quality craftsmanship and ensuring customers and employees are happy. Bonney is excited to continue striving to better the community that it has been strongly rooted to for the past 38 years.